Well, that's that. England are Grand Slam champions! If you want to relive that win, the match report is here. The Women's Six Nations doesn't end here though. You can watch Italy v France on the BBC Sport website from 13:30 GMT tomorrow. And highlights will be on BBC Two 23:55-00:25 on Sunday. Kelly Smith is drinking champagne from the bottle. Legend. The team gathers at the side of the pitch for another photo. They're not leaving Twickenham anytime soon. Champagne has been poured into the trophy and the England players are passing it round and drinking from it. I want to win a Grand Slam! It looks great. 'And again' comes the shout from the England players. Sarah Hunter gives into their wish and lifts the trophy into the air again. We await the arrival of Sarah Hunter. And as she steps forward to lift the trophy, there's a huge roar from the crowd. Flames go up around the pitch and the England players are covered in streamers. FUN. The rain continues to fall as drenched England players line up to get their winners' medals. Jess Breach looks particularly cold. Someone get that girl a coat. England thank the crowd as they wait to be given their trophy and the crowd thank them right back. "There have been some tough times and we've been quite hard on ourselves but we really enjoyed that moment when the final whistle went. "Every one of us is really proud. We try our best to inspire the generation that's going to follow us. "There's no better or special place to win a Grand Slam than the home of English rugby. "Tonight it's all about enjoying this victory because Grand Slams don't come along too often." England's player of the match Emily Scarratt: "It's pretty cool to win a Grand Slam at Twickenham. I'm glad we were able to put on a show here. "This performance is right up there as one of our best. Against France we didn't have a whole game performance but today we pushed ourselves to do that. It's been a long tournament but we're really grown. "Everyone has been talking about us being professional but it's early days and it's a really good start to us now we have the contracts." Simon Middleton gathers the team together in a huddle and it's all cheers - from the players and the crowd. It was a completely dominant performance from England, but they take the time out from celebrations to thank the Scottish players. 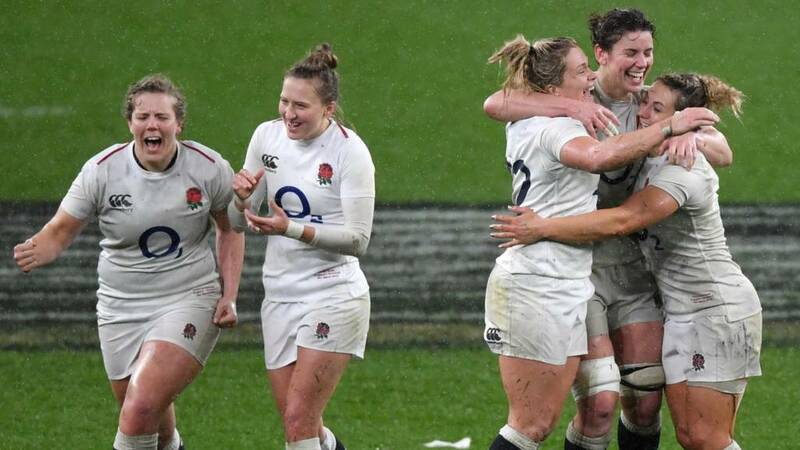 Maybe a bit of an anticlimactic end, given England were so far ahead, but the Red Roses are still enjoying this Grand Slam win. Players are jumping into each others arms. England's forwards get within centimetres of the try-line and Catherine O'Donnell drives over. The forward is absolutely drenched and has a face covered in grass, but she looks very pleased with herself. Emily Scarratt takes over kicking duties and it's a beauty. Scotland try to run it out of their 22 but concede a penalty. Leanne Riley wants to go for a quick penalty, but is called back and Emily Scarratt kicks to the corner. Time for one more try perhaps. Rachel McLachlan comes back on to replace Skeldon. The rain continues to pour at Twickenham. There's a break in play, it looks like Scotland's Lana Skeldon has been knocked out. She's back up now and Joy Neville asks her to leave the field. Emily Scarratt is deservedly given player of the match. She has been absolutely incredible today, creating some sublime attacking plays for England. The Red Roses look keen for another try before full-time, but they've given yet another penalty away.